Corporate volunteer programs both engage employees and fuel positive social change, but finding a fit for your business is not a one-size-fits-all endeavor. Use these 50 tips and ideas to get your company’s volunteering program off to an excellent start. Use Organizational Tools - For an ongoing program, put the right management tools in place with clearly communicated goals, an easy-to-navigate online sign up and a user-friendly reporting system to track the volunteer hours. Make It a Team Effort - If your organization is large, organize a community/employee engagement team to spearhead and organize efforts. Create a “roadshow” presentation and visit all departments to promote and energize your program company-wide. Use an Existing Meeting - For a smaller company, use one of your weekly staff meeting times for a field trip to help out a local nonprofit. Offer Incentives - Consider offering paid Volunteer Time Off (VTO) or other incentives for employees who spend time helping in the community. Communicate clear guidelines for what those hours should include and develop a simple accountability system. Start a Poll - Poll local nonprofits for their top needs. What volunteer activities would be better addressed by a company versus an individual? How can your company support the work the nonprofit is already doing? Use the information you gather as a starting point for community engagement opportunities. Survey the Opportunities - Gather opportunity suggestions via an employee survey or questionnaire, take nominations from employees or utilize employee brainstorming sessions to decide where to volunteer. Align Interests - Seek volunteer opportunities that align with your corporate mission. Decide if you will be strictly volunteering time (no cash outflow) or need to incorporate your volunteering efforts into the company budget. Ask Leadership to Lead the Way - It’s critical for the CEO and company directors to be part of the pioneering effort, especially when launching a company volunteer program. Be sure the company’s top-level team members are there and active in-service opportunities. Follow Up - Follow up by giving your employees the opportunity to share their comments about their experiences, both in getting engaged and post-volunteering feedback. An online survey is an efficient way to do this. Solicit Nonprofit Feedback - Collect feedback from your partnering nonprofits regarding the impact of your volunteering to evaluate if the program is a win. Ask for quotes from nonprofit staff members to use when promoting future volunteer opportunities within your company. 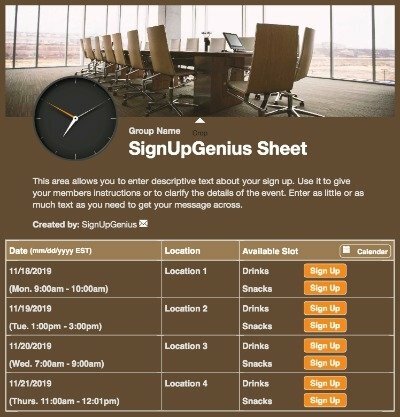 Connect Employees - Create an internal sharing site for employees to post about their experiences and share upcoming volunteer events. Plan an Item Drive - If you are kicking off your program, keep it simple and start with something like a toy, book or canned food drive. Invite employee feedback so the program grows and changes over time. Consider One-time Details - Think through every scenario your employees may face when getting ready to volunteer. Clearly communicate attire and expectations. Clarify if the volunteer event will provide food or if employees will need to bring their own. 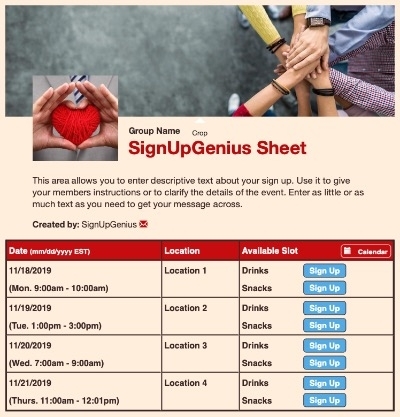 Genius Tip: Create a volunteer sign up and include any additional details in an attached file. Try a Fun Event - Plan a post-volunteer event such as a happy hour or food truck dinner to engage and thank participants. Join the Giving Tuesday Movement - Use the Tuesday after Thanksgiving to join a global day of giving back. Challenge employees to find a way to give back on that day, then share the ideas and use them as a springboard for future giving and volunteer opportunities. This is a great way to inspire your company to give back in one day. Divide and Conquer - Create “Action Teams” to go out into the community and volunteer in different capacities — whether through hands-on volunteering or mentoring nonprofits in best business practices. Incentivize Volunteering - Give employees the opportunity to earn grants for their favorite nonprofits once they reach a certain number of volunteer hours (for example, volunteering 25-50 hours can earn a $500-$2500 grant towards their charity of choice). Set Up an Angel Tree - Encourage employees in departments or on teams to adopt families during the holiday season and help with buying gifts. Connect with a community organization such as Angel Tree for more information. Genius Tip: Get started with these tips and ideas for organizing a holiday Angel Tree. Assemble Kits - “Kitting” provides an in-house opportunity for companies to help nonprofits create kits, whether it be medical supplies, hygiene kits or food packets to distribute locally or internationally. Operation Christmas Child offers a kit activity around the holidays. Give Blood - January is “National Blood Donor Month” — by partnering with the American Red Cross (which provides the promotional materials, equipment, supplies, and trained staff), your company can give back to the community. Get Competitive - Competitive fundraising is a way to raise money without leaving the office. Select a few charities to support, set a timeframe for giving, add an incentive for winners (perhaps a day off?) and even offer to match funds if your budget allows. Provide Training or Financial Support - If your business can offer accounting and financial expertise, invite a nonprofit (or several) to your business for training in bookkeeping and how to build a sustainable budget. Offer Promotional Support - Nonprofits tend to need help with branding and creating promotional materials. Volunteer to support a nonprofit by completing these tasks at a group training. Pack Book Bags - Assemble back to school appreciation bags for teachers at an underserved school in your community. Let Employees Choose - To get everyone involved, consider hosting a “volunteer day” for your company and have your team pick where to serve for the day. Groups of dog lovers can help a local shelter; recycling fans can pick up plastic at a local recreation area, etc. Tutor - Partner with at-risk schools to volunteer with their in-school tutoring and mentoring programs. Organize employees in teams of 3-4, so they can later reflect on the experience and share with the group. Get Creative - Seek out opportunities with evening and weekend art programs for underserved students. This is an excellent way for creatives to use their talents for the community’s benefit. Improve Grounds - Help a struggling school in your area with a building facelift (perennial plantings, quarterly grounds cleanup and landscaping) or make over a staff breakroom (paint, clean and replace furniture). Teach Life Skills - Volunteer to mentor low-income high school seniors in the fine art of job interviews, college or trade school applications and creating a livable budget. Apps for Elders - Recruit a tech-savvy team from your company to visit a local retirement center or workshop at the library to help people with technology. If you can also help with documents, understanding insurance or any other needs relevant to this group, all the better! Tech Support - Gather a team to organize free computer camps at community centers or the library for underserved students. Partner with a nonprofit already doing that sort of work, like Tech Journey. Adopt a School - Consider adopting a school to provide holistic resources for a variety of needs. Run a Sports Clinic - Host a free Saturday sports clinic at a low-income housing complex. Consider inviting a local sports figure to speak briefly and give out free sports equipment to participants. Host a Fun Run - If a local nonprofit sponsors a 5K or fun run, have employees volunteer to help with race day tasks such as registration, food and water donations and cleanup. Help with Grant-writing - If your business is familiar with grant-writing, help a nonprofit write grant proposals. Run Media Content - Have a group of volunteers manage the social media for a nonprofit by taking pictures at events, posting community fundraising opportunities and keeping social media content current. Give Administration Skills - Offer printing services for the nonprofit’s fundraisers, including stuffing and labeling invitations and envelopes. Make Medical Partnerships - Seek out partnerships with cancer infusion centers and hospitals by assembling and donating chemo after-care bags. Donate Expert Services - Partner with a local faith community to offer your expert services (car care, salon services, veterinary care, donated clothing items for job interviews) to families in your area. Plan a Community Cleanup - “My town is too clean!” said no one, ever. Partner with a local government organization to help clean up a park, green space or popular thoroughfare in your area. Organize Warehouses - Many nonprofits utilize warehouses or storerooms for donations and need groups to help bring some order to those spaces. Tackle Sorting - Organizing expired or damaged donations is another way your company can help a local nonprofit. These types of volunteer services really lighten the workload of an organization. Help with Construction - Playground construction and building maintenance are two community needs that welcome your company’s construction skills. Partner with Habitat for Humanity - Connect with this nonprofit to create a memorable volunteer experience for large groups. Improve Transition Facilities - Assist organizations in your area that help those in times of transition (people coming out of incarceration, maternity homes or rehabilitation facilities). Help with facility and grounds upkeep are always welcome. Do a Nonprofit Office Makeover - Boost morale for a local nonprofit by giving their office space a lift with art, plants, new paint or even a donation of office furniture or supplies. Throw a potluck or catered lunch for them to celebrate all they do for the community around them. Check out Operation Gratitude - Operation Gratitude assembles care kits for those serving in the military and can customize a volunteering partnership for any size business. Partner with Others - Engage with a service like GlobalGiving to find partner groups for volunteering. Utilize Visual Media Resources - Use your in-house photography or video editing skills to help an international relief organization promote their organization or create an inspiring message for potential donors. Deliver Supplies - Partner with an organization to help get much-needed medical supplies and/or equipment to developing countries or war-torn areas. Structuring your efforts and encouraging your employees to volunteer is an excellent way to foster a positive organizational culture while helping others outside your company. Use these tips and ideas to remind your employees that their skills are valuable not just in the office, but in the community and beyond. 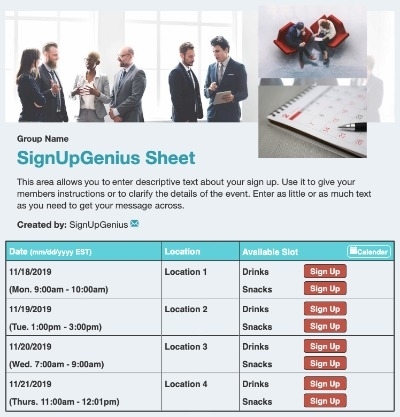 Plan company trainings and learning events with a sign up.